I was snooping around the shop today, and after moving a number of bags of yarn out of the way to make room to sit on the couch, a splash of colour caught my eye. 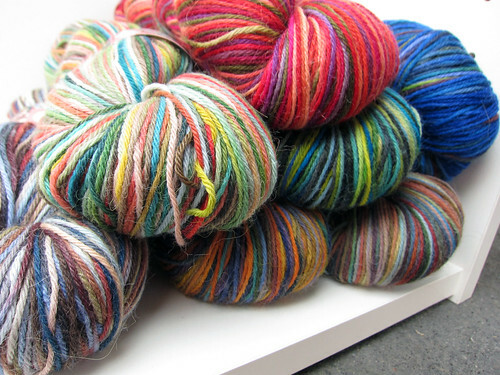 I took a picture right then and there to capture the perfect blend of yarns that had so grabbed my attention. Turns out that picture did not turn out well. 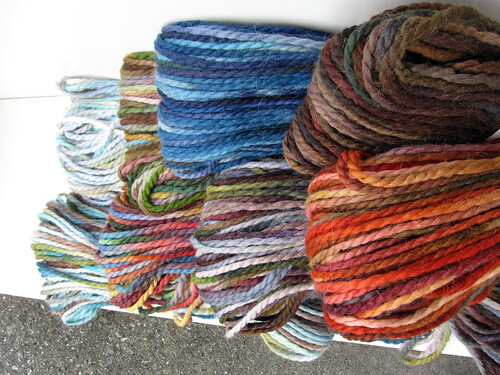 So I took the yarns out of their bags and figured that might work a bit better. Look at that. 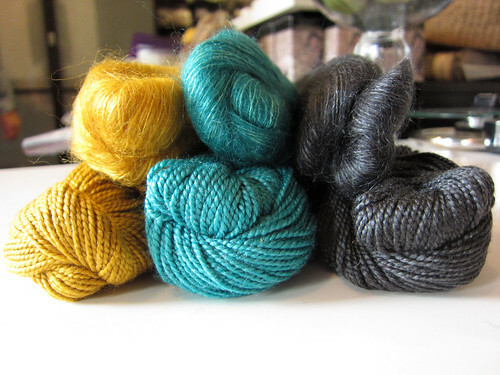 Gold, teal, charcoal, Shibui Staccato and Silk Cloud, stunning. In case you’re wondering who made this fantastic selection, it’s pure dumb luck. We had a few items on backorder with Shibui, and these are they! Just plain luck that they all came in together. 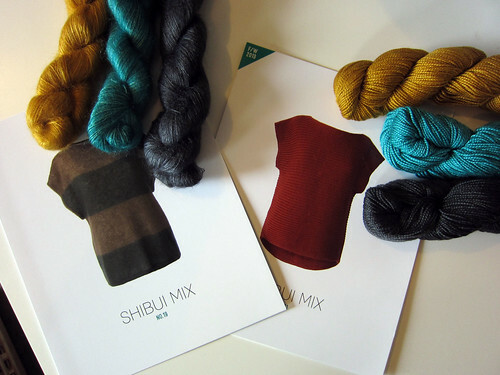 Conveniently, we also got in two new patterns from Shibui that call for these exact yarns! 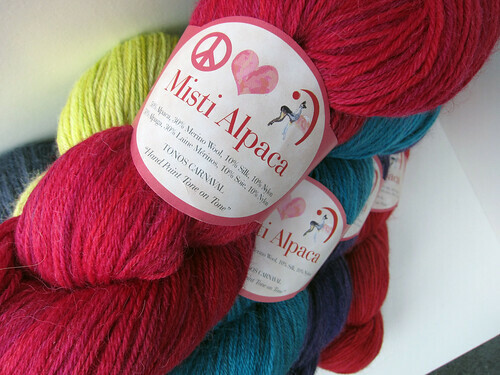 Well, that was all a bit of a surprise, as I had come in to shoot photos of the new colours of Misti Alpaca we got. First up, Tonos Carnaval. 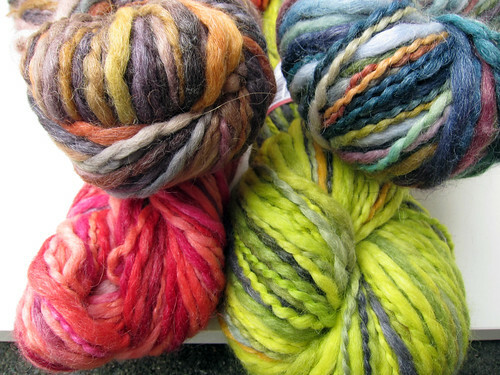 50% alpaca, 30% merino, 10% silk, 10% nylon. Next, Handpaint Sock. 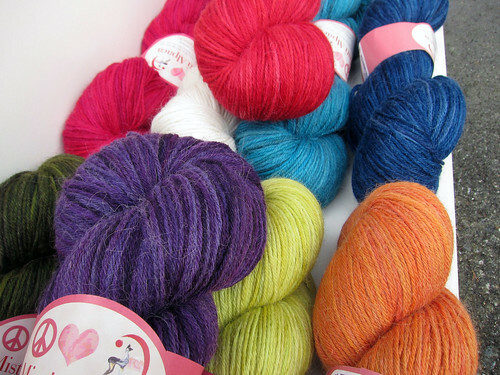 Also 50% alpaca, 30% merino, 10% silk, 10% nylon. Handpaint Chunky. 100% baby alpaca. And finally, BabyMeBoo. 50% baby alpaca, 30& merino, 20% bamboo. Ooh, all just gorgeous, eh? Lots new stock to share soon! This entry was posted on Wednesday, September 4th, 2013 at 3:00 pm	and is filed under Uncategorized. You can follow any responses to this entry through the RSS 2.0 feed. Both comments and pings are currently closed.